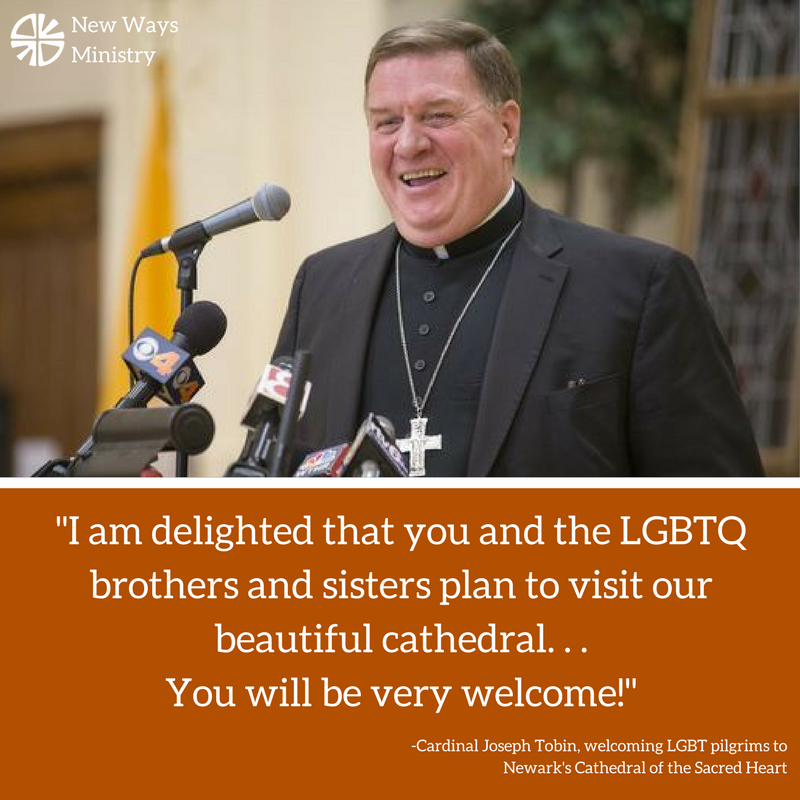 A pilgrimage of LGBT Catholics will be welcomed by Cardinal Joseph Tobin at the Archdiocese of Newark’s Cathedral Basilica of the Sacred Heart when they arrive there on Sunday, May 21, 2017. Sacred Heart Parish, South Plainfield, Church of the Precious Blood, Monmouth Beach are organizing the event, which seems to have had a serendipitous origin. “David Harvie was at a regional meeting in Brooklyn of the Interparish Collaborative [a group of about 15 Catholic parishes in the New York-New Jersey-Connecticut region that have LGBT ministries]. . . . He was seated next to Redemptorist Father Francis Gargani and talked about how there are so many beautiful church edifices that deserve to be seen. ” ‘I am a church architecture geek,’ Harvie said, mentioning, for example, the Cathedral Basilica of the Sacred Heart in Newark. The mass will take place in Our Lady Chapel of the Cathedral, at 3:30 p.m., followed by a tour of the building. It has been a long time since a bishop has welcomed a group of LGBT people to the local cathedral. Archbishop Raymond Hunthausen welcomed the DignityUSA convention to the Seattle cathedral in 1983 (though his welcome message was delivered by audio recording because he had been summoned to Rome). When Rochester, N.Y.’s Bishop Matthew Clark held a mass for the gay and lesbian community in his cathedral in 1997, 1300 people showed up for the space which could hold only 900, so the remaining spilled out onto the sidewalks. A year later Richmond, Virginia’s Bishop Walter Sullivan followed suit with a similar mass in his diocesan cathedral, telling participants, “You are welcome here. It’s about time someone told you that.” In 2015, a group of LGBT pilgrims led by New Ways Ministry was given VIP seating at the papal audience in St. Peter’s Square in Rome on Ash Wednesday. Harvie recalled first marching in the annual Gay Rights Parade in Manhattan at a time when a wall of police would separate the marchers from entering St. Patrick’s Cathedral on Fifth Avenue. Harvie expects an overflow crowd in the chapel, which can only hold 40 to 50 people. But that would be a wonderful problem to have, he said. Harvie is the facilitator of the LGBT ministry in Sacred Heart parish, South Plainfield, N.J. It is so good to see that a cardinal is eager to extend a welcome to a group of LGBT Catholics. Indeed, his example should be emulated by others. If bishops want to make Pope Francis’ message of welcome tangible to LGBT people, more instances like this need to take place. God will surely bless this beautiful initiative! For more information on the pilgrimage, click here or e-mail sacredheartigi@gmail.com. You can contact David Harvie at Church of the Sacred Heart, 200 Randolph Ave., South Plainfield, NJ 07080; phone: 908-822-5895. Joseph Tobin continues to show how he is a genuine PASTORAL inclusive cardinal by his gracious and sincere hospitality warmly extended to the LGBT Catholic community in New Jersey! See why Pope Francis selected him to lead the Catholic flock in Newark. Indianapolis’ loss is Newark’s gain. Joseph Tobin walks the Gospel walk…not just talks the Gospel talk. Thank you Cardinal Tobin for smelling like the sheep you serve! Cardinal Tobin is a truly real follower of the Christ! That’s the truth. Chaput will NOT get the coveted cardinal appointment he desires while Pope Francis is pope. Chaput could learn much from Blase Cupich of Chicago and Joe Tobin of Newark; they are genuine inclusive pastoral leaders of the Catholic Church in word and more importantly in DEED!